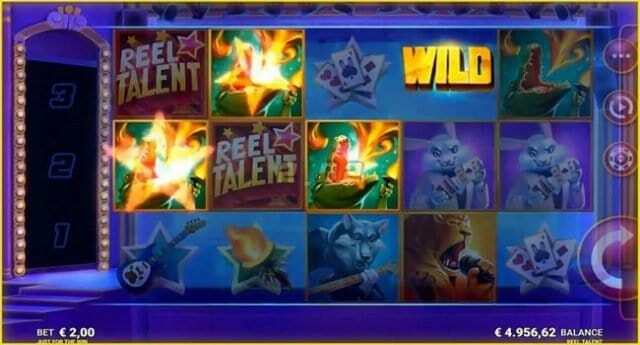 Reel Talent is an online video slot of 5 reels and 20 paylines powered by Microgaming. Play this slot game using any of your devices including desktop and mobile phones for 10p to £100 per spin. You can win 1,000 times of your total bet if you are lucky enough while playing this game. There are 2 bonus rounds in this game where you would get free spins. The game comes in with respin, wild symbol, superspins and symbol storage features. This slot machine powered by Microgaming software platform is based on a talent show and is filled with cartoon-style graphics. The game contains symbols like microphones, torches, guitars and playing cards. There is a rabbit magician, crocodile firebreather and wolf guitarist also exists on the reels of the game. The crocodile firebreather is the most paying symbol here and it will give you 15 times of your total stake f you land 5 of these symbols across a payline. The Reel Talent logo is also one of the most paying symbols and it will give you 50 times of your total stake. This is the wild symbol as well and it wil replace all other symbols on your screen. The Symbol Storage feature gets activated and is triggered once you get any win during the base game. Every win will be stored here and you will be rewarded a re-spin. But the wild symbol will not be stored in the symbol storage. When 3 or more of the symbols are stored in this feature during a spin, then it will trigger Superspin feature where 3 different levels exist.